After hearing a well-informed talk by the experienced Nepal road engineer Bleddyn Griffiths about his experience of the Nepal earthquake disaster, I suggested that we write a joint letter about both the science and the realities, which are linked in a more complex way than seismologists sometimes recognize. It was duly published in Geoscientist, the magazine for Fellows of the Royal Geological Society. Rather proud of this, really, as a non-geologist, and also impressed that geologists were willing to take seriously comments from a scientist and engineer outside their field. “In the aftermath of the earthquake tragedy in Nepal, scientists are rightly studying the seismic factors that can give rise to further landslides (Nature 532, 428 – 431; 2016). Such studies will be of inestimable value for many earthquake-prone regions around the world. 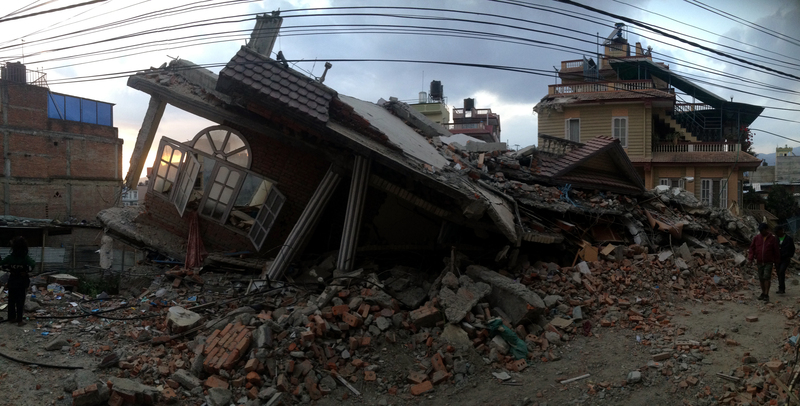 Earthquakes are dramatic events, but the situation in Nepal is exacerbated by two additional factors. One is that the foreland zone of the Himalayas, home to a majority of the population, consists primarily of clastic sediments that were produced by the uplift and subsequent erosion of the Himalayas and deposited by rivers (R.B. Sorkhabi & A. Macfarlane, “Himalaya and Tibet: Mountain Roots to Mountain Tops”, Geol. Survey of America Special Paper 328, 1-8; 1999). It is relatively easy to bulldoze a basic road through this crumbly weathered material, but such roads are subject to slow settlement, and the steep water-saturated slopes through which they are driven are liable to slippage at any time and at any scale when the steepness or saturation reach critical values (P. Bak et al Phys. Rev. A 38, 364-374; 1987). This means that better seismological understanding and measurement can contribute only partly to a solution. The other factor is the presence at high altitude of 1466 glacial lakes, the banks of any one of which may collapse to release its contents and produce a devastating flood that destroys roads and villages further down the mountain. Seismic events can precipitate such collapse, but so can heavy rain, snow, or the attainment of critical conditions. Len Fisher, University of Bristol, UK. Bleddyn Griffith, road engineer, ADB Nepal project.